The University of Otago’s Department of Philosophy gives the curious visitor a roisterous picture of the life of the mind in Dunedin. [The first hire in 1871,] Duncan McGregor, a graduate of the University of Aberdeen… was an electrifying lecturer with a well-developed ‘will to truth’ and pungent opinions on a variety of topics. … When it came to social policy, he thought that the ‘hopelessly lazy, the diseased, and [the] vicious’ should be incarcerated for life as a humane alternative to the process of Darwinian selection which would otherwise have weeded them out. McGregor resigned in 1886… and, fortified by his fifteen years as a philosopher, went on to become the Inspector–General of Lunatic Asylums. At a conference in Florence, [Alan] Musgrave read a typically forceful paper ‘Conceptual Idealism and Stove’s Gem’ which concluded with the ringing words: ‘Conceptual Idealism is a ludicrous and anti-scientific view of the world. … We should take science seriously, reject the Gem for the invalid argument that it is, and abandon the idealism to which it leads.’ There was a burst of applause followed by dead silence. The chairman, to get things going, asked if there any conceptual idealists present who would like to comment on Professor Musgrave’s paper. ‘Not any more’, came a voice from the back. Every academic department should write a history in this mode. For the whole (delightful) thing, go to http://www.otago.ac.nz/philosophy/history.html. For the philologically minded: the department’s Maori name is Te Tari Whakaaroaro. The dictionary tells me that “whakaaroaro” means “reflection or “meditation” but the elements, “whaka” plus “aroaro,” seem to add up to “making present that which is present.” Anyone with better insight into the history and connotations of the term is invited to straighten us out in the comments box. …When and how did ‘oral literature’ become an object of discourse? To that question I have an answer—the curious history I promised you. The lore [disciplina] of the Druids is thought to have been transmitted to Gaul from Britain, where it originated. Those who most eagerly wish to acquire it go there for the sake of study…. There, they are said to learn by heart a great number of verses, and not a few of them spend up to twenty years in study. Nor is it considered in keeping with divine law to commit these verses to writing, though [the Gauls] use Greek letters for almost all other kinds of public or private business. It seems to me that this rule was established for two reasons: one, that they did not wish this lore to be acquired by the common people, and two, that they did not wish the learners to rely on letters and therefore apply themselves less strenuously to memorization, as generally happens to those who, through the help of writing, lose their facility of learning and their memory. Whereas I used to follow the reports on the popular uprisings in Egypt, Libya, and Yemen, I have caught myself shunning news from Syria, especially the visual footage from the urban battlefields: Daraa-Damascus-Hama- … When about two years ago the tumult of the Arab Spring broke out in the Middle East, an anxious thought of Syria immediately crossed my mind. I expected Syria to join. Knowing the country’s uneasy political past, I sensed how badly it was likely to turn out. The long-lasting silence from Syria was ambiguous: It could be a sign that Syria was doing better and would be able to solve its long suppressed conflicts by taking a path of reform. Or maybe it was the silence of a population too broken in spirit to mount a protest. Deep down, however, this silence gave me hope that Syria might be spared this time the bloodshed of post-revolutionary Egypt and especially that of the excruciatingly brutal civil war in Libya. When the protests finally started, I did not follow them. Glancing only briefly at the headlines, I inexplicably and for a long time hurried to turn away to something else. I did not want to dwell on my reaction, until suddenly in mid-summer I saw Aleppo in the headlines. The short answer is that it’s simply too late. There was a period of so-called “public comment” about a year ago which had a small number of takers. I think that the people who commented were, like me, ignored and put off, but that would have been the right time to raise a hue and cry. At this point, the store has sold off practically all of its extant book inventory — tens of thousands of books. (I think there may still be a few hundred book SKUs (items) in the system that aren’t textbooks.) Some titles were sold to customers at reduced prices, some more recent titles were returned to the publisher at their original cost, and everything else went to a jobber who paid pennies on the dollar. 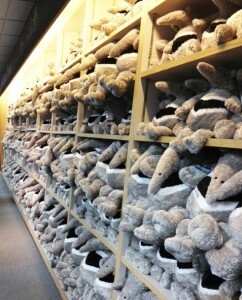 The store has doubtless taken a big loss on those books, but consigning them has meant the store can free up shelf space for more profitable inventory, like plush anteaters. Suppose, for the sake of argument, that a Save The Bookstore movement coalesced, and had at the top of its list of demands: “Bring back our books!” From a business perspective, this cannot be done. You cannot liquidate inventory at pennies on the dollar and then bring back the exact same inventory in at the regular wholesale price of 25-40% off list. If I were the Associate Vice Chancellor of Student Affairs, I would fire the Bookstore director who did such a thing. The only way out would be if a director could make a compelling case that the store could sell, say, at least three copies of each book every year. That is far in excess of the sales rate of the average trade book at the former Bookstore, which was .75 to 1 copy per year. If the director were to commit to selling three copies of every title every year, the customers of the store would have to make a commitment to buy them. I could see a sort of Kickstarter-style campaign, where people would agree to reserve $25, $50, or $75 book gift certificates, good for one year and not redeemable for cash, in their names. If the inventory were funded up to or over a certain level, say, $75,000, the donors would be charged, the certificates issued, and the inventory purchased. Without such a setup… we know what that looks like already, where well-intentioned people loved the Bookstore so much, they bought all their books online. When I think about the Bookstore in this respect, I think of Abie Glassman, the Jewish peddler from John D. Fitzgerald’s Great Brain children’s books. Glassman came to stay and sell notions in Fitzgerald’s fictional Mormon community. He cared about his customers, and he was beloved. Nonetheless, he starved to death because nearly everyone went to the official Mormon ZCMI store; it was simply more expedient for them to do so. The idea of a crowdsourcing campaign gets to the bottom of “how to get our store back.” The argument for the destruction of the Bookstore was economic; any counter-argument, at least in the current reality, will have to be economic as well. A university bookstore is a business. It brings money into the University. When that money dwindles, it means that there is less to support University programs, and, especially when State money keeps getting scarcer, administrators have to fill the gap, period. Anyone who wants to bring the UCI Bookstore back will have to come up with a realistic business plan of his or her own, one that fills that gap over the long term, or comes very close. I said, “at least in the current reality.” In the world of principles, which is where many readers reside, things are — or, should be — different. Access to books, and the promotion of higher forms of literacy, should be parts of a university’s mission. Libraries, by their nature, go only so far with this mission; every book acquired must be argued for, and every book acquired must help develop a collection. A real university bookstore is not under these constraints; people are exposed to the streams of fiction and non-fiction in real time, and they can get what they want without contending with someone else’s loan period. What is that worth? Could a university bookstore be operated, not as a profit center, but as the part of the educational enterprise that encouraged reading? Those who play the zero-sum game would ask, “Which would you rather have: a real university bookstore or more students getting financial aid?” I invite you to think your way out of that question. This is, perhaps, too harsh a place to end, so I will return to an earlier time. When I was a graduate student and entry-level worker at the Bookstore, there was a frequent customer from the English department named Professor Homer Obed Brown. He was known at the store both for his benevolence and amiability, and for his besottedness with books. When, in my capacity as a graduate student, I would go into his office, every horizontal surface would be piled four or five feet high with books, the library’s mingled with his own. When, in my capacity as a Bookstore worker, I would walk with him through the store, we would talk, and he would absentmindedly slip books into his basket, until at last he would present himself at the register with some twenty-odd books at a time. I would like to think that, if he were alive today and had known of the Bookstore’s problems, he would have solved them by buying up the literary criticism section outright. Immortal and ever-living God, we most heartily thank thee for that thou dost vouchsafe to feed us who have duly received these holy sacraments with the spiritual food of the most precious Body and Blood of thy Son our savior Jesus Christ, and dost assure us thereby of thy favor and goodness toward us, and that we are very members incorporate in the mystical body of thy son, which is the blessed company of all faithful people, and are also heirs, through hope, of thy everlasting kingdom, by the merits of his most blessed death and passion. It’s a grammarian’s delight (and, on checking, I find that my memory made only two mistakes, neither breaking with the rhythm): a main clause to which are subordinated four “that…” clauses, each with its own attack and consequence (“for that thou dost vouchsafe… and [that thou] dost assure.. and [that thou dost assure us] that we are… and [dost assure us that we] are also heirs…”). Never a dull repetition; always a variant skewing back to the main point; the “members incorporate” of the long, ornate sentence admitting either an interpretation that would make them all equivalent, or one that would make them a series of differences fanning out from an initial act of grace (“we thank thee for that”). We were off-and-on churchgoers in my family, to the point that friends, relatives and “the help” took us children to a variety of churches in our parents’ stead, but despite the lace and candles that I remember from the Catholic cathedral and the intense musical athleticism of the black churches, the language is what I remember from the Episcopal parish that we were supposed to call home– that and a smell of floor wax and a big brass cross whose nodal point was surrounded by a halo with a curious ring of wiggly flames. I remember a few hymn tunes from my childhood. Nothing about Sunday School. But those long, swerving, delaying and crosscutting sentences, absolutely. There was nothing else like it in my experience. Maybe those pieces my father liked to play on the piano, that started with a simple little tune and wound it up into so many layers of argument and chatter that you couldn’t keep up with them, that were called Bach. James Wood, recently, wrote a birthday card in the New Yorker for the Book of Common Prayer (350 years old in its 1662 revision; 473 if you’re looking at Cranmer’s first attempt, which dates from 1539). He praises Cranmer’s ritual prose for its “simplicity and directness… ‘coziness’ or ‘comfortability. '” I wouldn’t think of simplicity first. Coziness? Well, anything that you’ve heard for decades tends to get cozy in your ear; that’s no explanation. “Comfortability” is a borrowing from Cranmer (the “comfortable words” are the exhortation to come forward to communion). What comes most to my mind is the slanted, scarred quality of Cranmer’s words, acknowledging and bewailing their impossible or insincere content under a perfect pastoral straight face. The words of administration of communion name the bread and wine as the body and blood, but in the next sentence specify that the congregant is to take and eat them “in remembrance.” To paraphrase a bit: “Yes, that’s what we would like to say about these mere material elements, but we can’t truthfully state that that’s what they are, so let’s follow up with this more commonsensical version of the presence doctrine which is all you’re going to get anyway.” Another fine bit of truthful and artful dodging is the way the officiant uses the subjunctive mood (a piece of old-fashioned English grammar one might have to learn from Cranmer, if growing up in Tennessee): the remission of sins is performed not by the priest, but (in hope and under conditions) by the Almighty who is invoked but not compelled. As with so many other grand churchly paragraphs left us by Archbishop Cranmer, the mustering of clauses and sonority might give one the impression that something wondrous has been done, but a closer inspection reveals that the operative clauses were shrewdly minimized: “Almighty God… have mercy upon you, pardon and deliver you from all your sins, strengthen and confirm you in all goodness,” etc. : all in the subjunctive mood. The swinging of robed sleeves and censers, if any, is just decoration. The operative bit is no performative speech act, but a wish. It might happen, then again it might not. And when burying someone, the Prayer Book says that it is done “in sure and certain hope of the resurrection to eternal life.” Clever Cranmer again: what’s sure and certain is not the resurrection, but the hope of it, and perhaps our hope is sure and certain only because it’s one of those things that are “meet, right, and our bounden duty” to say. I always found this escape-clause comforting, in a grim way, when consigning people I loved to the ground. As James Wood does not say (perhaps he is reporting on the state of things in England), the old Prayer Book, last revised for US Episcopal churches in 1928, is no longer in use. The 1970s substitute offers a modernized version of all the services and “traditional” versions for some of them (1928 with light revision). Comparison shows what subtleties are lost. Where Cranmer had written these lines for the congregation: “We do earnestly repent and are heartily sorry for these our misdoings,” the 1970s US Episcopalians go all touchy-feely: “We are truly sorry and we humbly repent.” This is getting it backwards, according to the somewhat cynical psychology of the 1539 service book. You repent first and then you have the luxury of feeling sorry. In the 1970s, you are subjectively, emotionally sorry first and you describe that as humbly repenting. I don’t know what an omniscient, omnipotent being would feel about anything, but my impression is that the 1539 people are playing their cards a little more carefully, allowing for more distrust of their own motives, and the 1970s people are unable to tell the difference between a feeling and a state of affairs. James Wood’s article ends with cases of “reverent irony” in citations of Prayer Book language by Woolf and Beckett. I rather think the reverent irony was there to start with; but you have to discover it. In my case, it took memorizing those labyrinthine sentences and uncoiling them in my mind, again and again, over decades, to see what a Cheshire Cat of a shaggy dog the cautious archbishop had perched on the tree branch. From the second year of graduate school until about five years after I left, I worked for my university’s bookstore. I did a variety of things, ranging from heaving medical textbooks onto the shelves for $6.15 an hour to working as the “Internet Projects Manager,” which basically meant that I was a one-man web development shop in direct competition with Amazon. It was a wonderful place, with visionary people. We had a classical music CD department, an anime department, and about 100,000 books on the shelves in academic and non-academic subjects. We had an ongoing reading series with authors from our MFA program, like Maile Meloy, Glen David Gold, Aimee Bender, and Michael Chabon. My bosses turned me loose on web technology a couple of months after the final bits were dry on the first web browser, NCSA Mosaic. We were one of the first bookstores to try e-commerce, and my bosses and I wound up on the cover of the June, 1996 cover of American Bookseller and in the LA Times. Amazon put an end to our nascent, at times Rube-Goldberg-like efforts, and I struggled with the limitations of being one person trying to fight an e-commerce battle I had no chance of winning. One boss left in frustration, then I left, and the second boss retired a couple of years after that. After that, the focus of the store shifted away from strategy and towards operations. By the time a few years had passed, without anyone at the store completely realizing how quickly it was happening, Amazon had eaten our store’s lunch. Together with its competitors, it had peeled off too many of our textbook customers. It was because of a monopoly on textbooks and their profits that we’d been able to do all this great stuff; without that monopoly, the number of students coming through our doors started to dwindle and our margins started to thin. The end of the store soon followed, brought from on high by administrators who were frustrated that the store was no longer a cash cow. There was a sham of “consultation” with the University community — my letters were met with form letters — but management consultants were brought in, and they made the brutal suggestions that you would expect. My friends there who cared about books and literary values were forced out, along with all the employees over 50. The store has now been emptied of books. It is now selling textbooks, plush animals, and sweatshirts. It has been, in a word, deconsecrated; the word “Bookstore” has been taken out of the name. 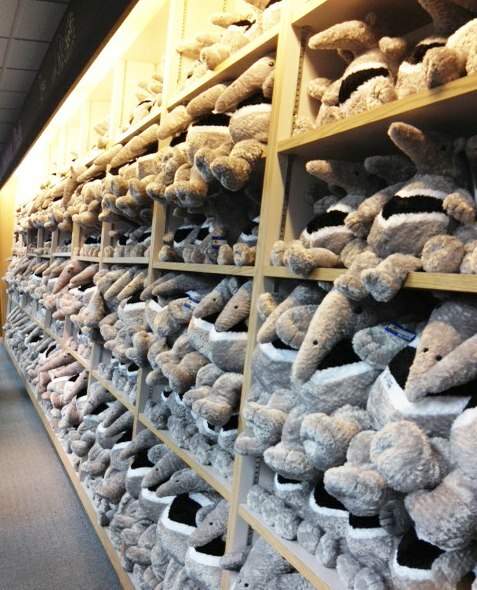 So here is a photograph of the shelves that used to hold literary criticism and philosophy, now filled with plush anteater mascots. Look upon it and despair. NOTE: I’ve published a follow-up piece to this article at http://printculture.com/the-late-bookstore/. Watch this if you can find it. I will never see this show, because I’m not in the habit of going to the theatre (and don’t live in New York), but I was glad to read that a Broadway adaptation of the documentary film, “Hands on a Hard Body” is about to open. Maybe the film will find a new audience and be available for streaming somewhere (it’s currently not available for rental on Netflix or Amazon). Short plot summary: a car dealership in Texas runs an endurance contest in which contestants must keep a hand on a brand new fully loaded pickup truck. The last person standing wins the truck. I remember watching the film when it showed briefly in a theater in L.A. back in 1997. The audience laughed derisively (“look at those hicks!”) when the interview subjects waxed philosophical about the meaning of the contest in their heavy Texas drawls. But the film itself never demeans its subjects. My sense was that the filmmakers went into the project with a certain ironic distance but then got pulled into the human dramas playing out in this manufactured microcosm. A real gem.